This customer recently came to us with plans to turn his Camaro into the most accurate t2 replica out there. His dreams are finally a reality and he has put us to work. 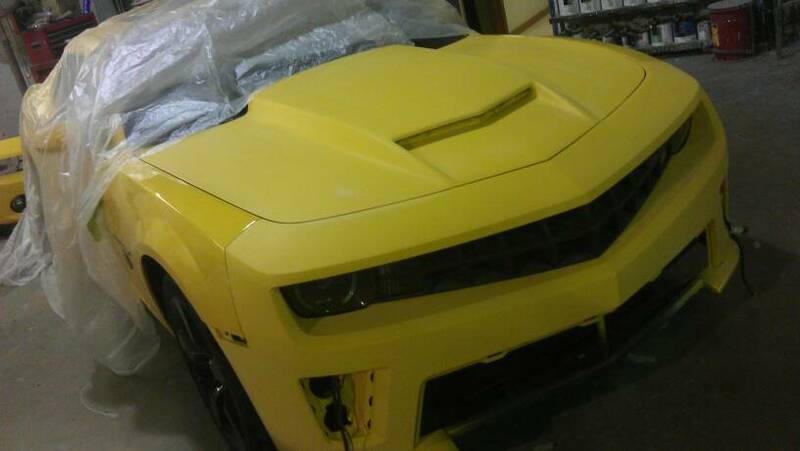 A few items to start off with will be a MPD z force hood, zl1 front bumper, and painted stripes. The list goes on and you will have to follow along to see the rest. I dont remember the movie car with a sunroof. Doesnt ACS acutally make that exact bumper and hood? Not trying to knock him cuz I actually think his car will look better than the real T2 car, but if you want exact replica i think the ACS stuff is closer. Keep in mind this is the owners interpretation on the t2. He wanted to use quality parts and still retain the look. I might not be 100% in the end but it will definitely make you look twice. no doubt! i think it will look great like that last picture i posted. But you said "the most accurate replica out there." when in fact it wont be. sorry just knit picking. Keep up the good work! Are you going to paint it to the correct color as well? Drives: Camaro Of The Week. hmmmmm... lets see the result.. I agree. To each his own. is he gonna do the side mirrors, rear diffuser, and wheels too?